I found the following on the internet. They are under the name "IXO" and are listed as 1:43 scale die-cast models. 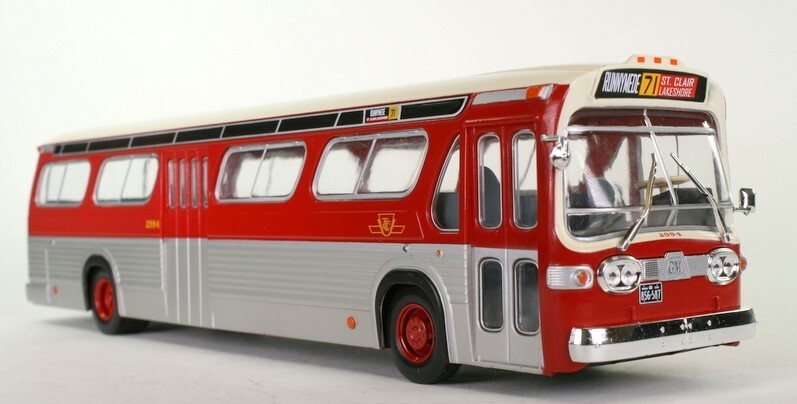 Can anyone give us the exact dimensions for these buses? Any additional information is highly appreciated. I saw these buses online and looked real close at the details. I like the fact that it is a larger 1/43 scale than Corgi so it is easier to see the flaws. I actually want a Rapido Trains version in 1/25th scale which is huge. IXO might have done better than Corgi and Busch in some ways but also got the shape wrong in other ways. The rear window is off. The front may have been better in some ways but worse in others, but the glaring mistake for me is the front corners of the bus. Both left and right are off a lot. The real bus tapers like a dull pencil at about a foot from the front. 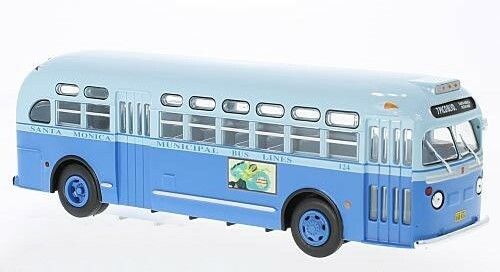 The front pillars of the real bus are not very thick but the IXO model seems to show a very wide. Here is another IXO GM "New Look" model, this time is a TDH-5301 ex, Fifth Avenue Coach in MaBSTOA service, number 3165. However, the engine compartment hatch lights are wrong. although it is better than corgi and busch it is still flawed in big ways, the rear window is not shaped right, the windshield is close but the glaring flaw for me is what manufacturers call the A pillar, the very front pillar to the roof on these are wider than on the real bus. I would have been happy to have these in 2000 but as Rapido Trains has made an almost perfect version I cannot go with this. I settled for corgis and buschs because I was desperate then. but with the bus being bigger it would kill me to look at the mistake. What many people do not see is how the driver's window is since it is close to the front which tapers so the front edge is not in line with the rest of the bus. Now another taper, the one where the bus tapers greatly at the top means that the window also is not perfectly vertical as the other windows are. The window leans in at the top. If you look at pictures of a fishbowl bus against the picture of a toy you will see this. From the inside of the bus the windshield and driver's window overlaps. there is a very skinny pillar between the driver's window and the windshield. The biggest flaw that you overlooked are the 5303 taillights that don't belong on this first generation newlook. Why IXO didn't keep the 5301 taillights for this model as a carryover from their other buses doesn't make sense. Otherwise, despite all the flaws you described of which I 100% agree with, I had to add this model to my collection. It's better than nothing despite its shortcomings. Let's hope their next bus is a Flxible newlook.